When Secretary Frelinghuysen replaced Blaine in November 1880, he inherited a set of tangles caused by the Maine politico's robust sense of America's place in the world. Blaine shared William H. Seward's ambitious Whig vision of the national future: the United States should be a great trading power, supreme in the markets of Latin America, linked to the great undeveloped markets of Asia through commercial treaties, and boasting a chain of protective bases in every ocean. Elements of this star-spangled scheme included an American-dominated canal between the Atlantic and the Pacific, a Pan-American union and reciprocity treaties, and a consensus among the "civilized" powers to share equally in trade with the "backward" nations. The trouble was that in 1881 these imperial fancies were spun on behalf of a United States with a navy of thirty-seven fighting ships (exclusive of thirteen monitors for coastal defense), thirty-three of which were wooden sailing vessels in an age of armor-plated steamers—a United States, moreover, that had never replaced the merchant marine destroyed during the Civil War and that had no professional diplomatic or consular service. The result was thwarted initiatives at every turn. Blaine had tried to intervene in the War of the Pacific between Chile and Peru—won by Chile—with a strong pro-Peruvian stand. But Chile's navy (built, for the most part, in British yards) was stronger than anything the Americans could put to sea. When Frelinghuysen took over, he had to extricate the United States from the situation, and in 1883 the Peruvians were forced by Chile to accept the harsh Treaty of Ancón. In the same fashion, he had to repudiate Blaine's overtures to help Guatemala in a dispute with Mexico in return for bases and concessions. Frelinghuysen also canceled Blaine's planned Pan-American conference as premature and unlikely to win support. Frelinghuysen was as taken as Blaine had been with the idea of American capital, machinery, and farm products being used to clothe, feed, and uplift the world's millions, but he was more readily made aware by events that the hour had not yet struck. He was not only battling the nation's military weakness but profound congressional apathy. In 1884 he did secure a treaty with Nicaragua that gave the United States canal rights and a virtual protectorate, but it failed in the Senate even before it could create diplomatic problems with the British. (Both nations had promised by the Clayton-Bulwer Treaty of 1850 that neither would exclude the other from Central America.) He negotiated reciprocity treaties with Mexico, Spain, and Santo Domingo, but Congress would not implement them. He attempted, in 1884, to join an international consortium that would ostensibly open trade with the Congo to the United States on equal terms with other nations, but in the last month of the Arthur administration, Congress rejected the plan. In the words of the Nation, "the people of the United States want[ed] as little of foreign policy as possible." Frelinghuysen also encouraged the mission of Commodore Robert Shufeldt to negotiate trade concessions in the "hermit" kingdom of Korea, actually a protectorate of China. Shufeldt and the Chinese foreign minister worked out an agreement in 1882, the Treaty of Chemulpo, but within another two years the Japanese moved in on a footing of "equality" with the Chinese. In time, they would shut both the Chinese and the Americans out. Frelinghuysen hoped for some influence in the Indo-Chinese nations of Annam, Tonkin, and Cambodia, but the French, in 1884, completed the process of making the entire area a de facto colony ruled from Paris, with no outsiders admitted to benefits. It was clear that the United States had the beginnings of a will to join in the process reaching its climax in the early 1880s, whereby Africa and Asia were carved up for the white man's benefit. It was equally clear that the United States lacked the means to join the feast. Arthur was at least willing to propose that the country begin to acquire the means. In his 1881 annual message he urged a stronger navy, and the next spring he gave full support to William E. Chandler's vigorous administration of the Navy Department. Chandler pruned the officer corps of superannuated wood-and-canvas devotees and created the Naval War College. He set up a naval advisory board that broke with the idea of coastal defense as the navy's major mission, and submitted a plan for a fleet that could project America's power thousands of miles from its shores. The board followed earlier plans for a fleet of sixty-eight ships, most of them steel-hulled, and recommended commencing with the construction of three armor-plated cruisers with good speed, range, and power, plus a dispatch boat. Congress agreed, and Arthur signed the bill authorizing the construction of the Atlanta , the Boston , the Chicago , and the Dolphin . The public nicknamed them the ABCD ships. Chandler was especially pleased that the law allowed him to scrap old vessels whose repair bills exceeded 20 percent of their original cost. "I did my best work," he exulted, "in destroying the old navy." 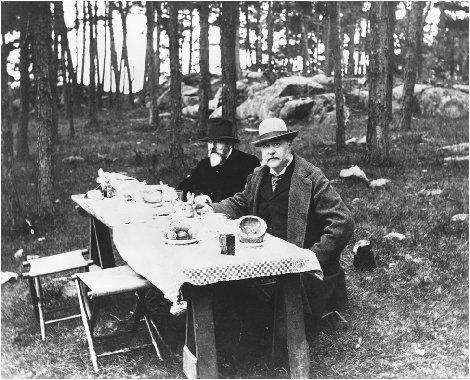 President Chester A. Arthur takes a break from his duties at the White House to enjoy a rustic picnic with a companion. for seven more cruisers in 1883, even though no graft was proved. In addition, he failed to get the legislators' support for a string of coaling stations around the world. And only one of the ABCD ships, the Dolphin , had been put in commission by the last day of Arthur's term in office. All the same, the accidental president had set the wheels in motion for the naval revolution of the 1890s, the era of Roosevelt and Mahan. He planted at least some of the seeds they watered. And in his final hours as president he had the pleasure of signing a measure authorizing two more cruisers and two more gunboats. In all other areas, the Arthur record remained relatively barren. He continued to authorize futile advances toward building a newer, whiter southern Republican party, though he made some routine patronage appointments of black leaders such as P.B. S. Pinchback and Blanche K. Bruce—veterans of Reconstruction's heyday—to federal posts. But his heart was not in maintaining the old commitments, and when the Supreme Court, in the so-called Civil Rights Cases of 1883, gutted 1875 legislation guaranteeing blacks equal protection of the law, Arthur gave no support to proposed new antisegregation legislation. Although he had some liberal (for that day) notions on the subject of protecting and educating the Indians, they were not translated into any policy that he pressed on Congress. As convention time in 1884 approached, Arthur had neither a strong record nor many friends to support a reelection bid. His appointments had alienated many Stalwarts without appeasing a significant number of Half-Breeds or winning the hearts of the independent reformers. Neither had he built a public image or constituency; on the contrary, he was conspicuous in his efforts to avoid furnishing good copy to the press. Widowed in January 1880, he lived quietly in the White House, with his little daughter and college-age son, giving elegant state dinners and paying considerable attention to menus and furnishings but yielding nothing to democratic curiosity. "Madam," he once snapped to a visitor, "I may be President of the United States, but my private life is nobody's damned business." Nominations are not won that way, and though Arthur's name was offered as a candidate when the Republicans convened at Chicago, he was quickly buried in an avalanche of votes for Blaine. It was just as well. He would not have survived his second term. He died only twenty months after leaving the White House, and the mists of oblivion at once began to settle around his tall, portly but handsome Gilded Age figure. His contemporaries seem to have been grateful to him for doing better than they expected. Historians, when they thought of him at all, belatedly came to see his administration—joined to Garfield's tragically short one—as a very modest milestone on the road leading to the heights of the imperial presidencies of the succeeding century.